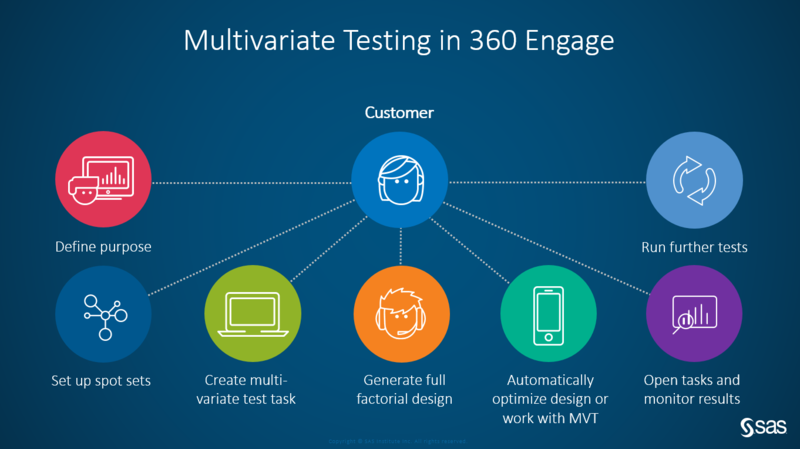 Multivariate testing (MVT) is another “decision helper” in SAS® Customer Intelligence 360 that is geared at empowering digital marketers to be smarter in their daily job. MVT is the way to go when you want to understand how multiple different web page elements interact with each other to influence goal conversion rate. A web page is a complex assortment of content and it is intuitive to expect that the whole is greater than the sum of the parts. So, why is MVT less prominent in the web marketer’s toolkit? One major reason – cost. In terms of traffic and opportunity cost, there is a combinatoric explosion in unique versions of a page as the number of elements and their associated levels increases. For example, a page with four content spots, each of which have four possible creatives, leads to a total of 256 distinct versions of that page to test. If you want to be confident in the test results, then you need each combination, or variant, to be shown to a reasonable sample size of visitors. In this case, assume this to be 10,000 visitors per variant, leading to 2.5 million visitors for the entire test. That might take 100 or more days on a reasonably busy site. But by that time, not only will the web marketer have lost interest – the test results will likely be irrelevant. Today, for expedience, web marketers often choose simpler, sequential A/B tests. Because an A/B test can only tell you about the impact of one element and its variations, it is a matter of intuition when deciding which elements to start with when running sequential tests. Running a good A/B test requires consideration of any confounding factors that could bias the results. For example, someone changing another page element during a set of sequential A/B tests can invalidate the results. Changing the underlying conditions can also reduce reliability of one or more of the tests. The approach SAS has developed is the opposite of this. First, you run an MVT across a set of spots on a page. Each spot has two or more candidate creatives available. Then you look to identify a small number of variants with good performance. These are then used for a subsequent A/B test to determine the true winner. The advantage is that underlying factors are better accounted for and, most importantly, interaction effects are measured. But, of course, the combinatoric challenge is still there. This is not a new problem – experimental design has a history going back more than 100 years – and various methods were developed to overcome it. Among these, Taguchi designs are the best known. There are others as well, and most of these have strict requirements on the type of design. safety consideration. The analytic heavy lifting is done behind the scenes, and the marketer only needs to make choices for business relevant parameters. The immediate benefit is that that multivariate tests are now feasible. The chart below illustrates the reduction in sample size for a test on a page with four spots. 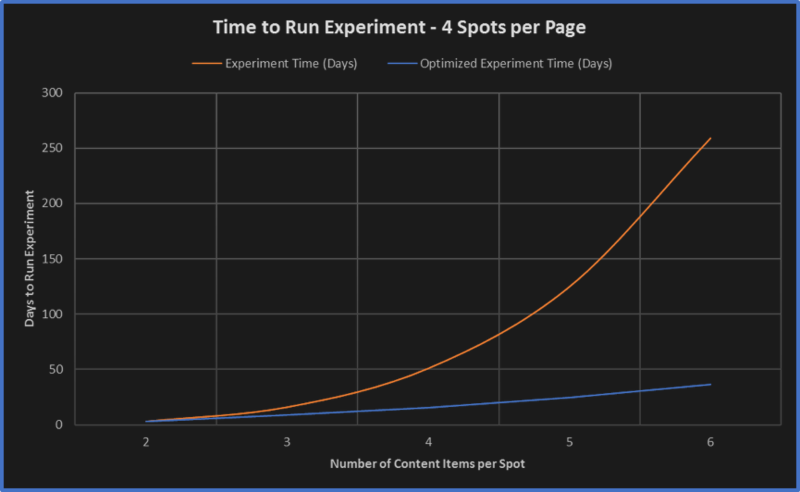 The red line shows the number of variants required for a conventional test, and how this increase exponentially with the number of content items per spot. In contrast, the blue line shows the number of variants required for the optimized version of the test. 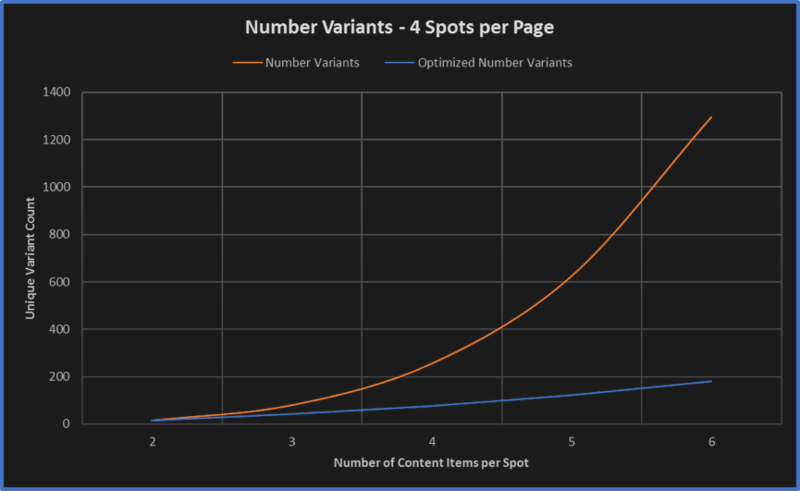 Even with three content items per spot, there is a 50 percent reduction in the number of unique variants, and this percentage grows larger as the number of items increase. We can translate these numbers into test duration by making reasonable assumptions about the required sample size per variant (10,000 visitors) and about the traffic volume for that page (50,000 visitors per day). The result is shown below. A test that would have taken 50 days will only take18 days using SAS’ optimized multivariate testing feature. More impressively, a test that would take 120 days to complete can be completed in 25 days. What about those missing variants? If only a subset of the combinations are being shown, how can the marketer understand what would happen for an untested variant? Simple. SAS Customer Intelligence 360 fits a model using the results for the tested variants and uses this to predict the outcomes for untested combinations. You can simulate the entire multivariate test and draw reliable conclusions in the process. The Top Variant Performance report in the upper half of the results summary above indicates the lift for the best-performing variants relative to a champion variant (usually the business-as-usual version of the page). The lower half of the results summary (Variant Metrics) represents each variant as a point located according to a measured or predicted conversion rate. Each point also has a confidence interval associated with the measurement. In the above example, it’s easy to see that there is no clear winner for this test. In fact, the top five variants cannot reliably be separated. In this case, the marketer can use the results from this multi-variate test to automatically set up an A/B test. Unlike the A/B-first approach, narrowing down the field using an optimized multivariate test hones in on the best candidates while accounting for interaction effects. Until now, multivariate testing has been limited to small experiments for all but the busiest websites. SAS Customer Intelligence 360 brings the power of multi-variate testing to more users, without requiring them to have intimate knowledge of design of experiment theory. While multivariate testing will always require larger sample sizes than simple A/B testing, the capabilities presented here show how many more practical use cases can be addressed. Multivariate Testing: Test more in less time was published on Customer Intelligence Blog. Leads are the lifeblood of any sales effort. But not all leads are created equal. Some have a high value for an organization and represent a realistic opportunity to win business. Others are early-stage engagements that take months or years of development. Over the years, the SAS marketing organization built a complex method of passing leads from marketing to sales. The process was similar to what other companies have in place, that is, leads that met a set of rules were qualified and then sent to a salesperson to follow up. The system was effective but difficult to manage, especially when business needs changed. Increase the number and percentage of leads that convert to opportunities. This meant identifying the best leads and finding a faster way to pass more high-qualified leads to sales. Improve the outcomes from the lead conversion process. Obviously, high-quality leads are essential to creating a larger pipeline of deals. The team needed a better way to score, and then prioritize, leads. An added wrinkle was that the project had to be global. For example, a lead in Australia would have the same meaning as a lead in Germany. That way, the company could compare lead performance across geographies and fuel global decisions about what strategies would be more effective. While the previous rules-based model was geared more toward quantity, the team opted for a model-based approach to lead scoring that emphasized quality based on likely outcomes. The team developed an analytics-driven model that could evaluate the range of customer behaviors (registrations, website page views, e-mail clicks, and so on) to identify the best leads. Beyond the quality-versus-quantity discussion, the sales and marketing teams agreed that the timing of the lead handoff to sales was also important. To accomplish this effectively, the model evaluated many behaviors, and once certain criteria were met, the information was added to the customer relationship management (CRM) system. To improve the lead conversion process, the team also focused on converting more sales-ready leads. Not only did the new scoring model evaluate more behavioral data, but that information was passed on as a “digital footprint” for each lead. The salesperson can see interactions for the lead from within the CRM system, giving her important information to guide her initial outreach. Additionally, the team decided not to send all leads to the CRM system. Because the model does a better job of classifying better leads, those that aren’t routed to sales go to a lead-nurturing pro- gram, where the contact receives a cadence of relevant e-mails. The contact’s behavior when receiving those e-mails (click-thrus, registrations, website visits, etc.) are all fed into the model. When the lead-scoring model was still in the early stages, the initial feedback was positive. Salespeople appreciated that the leads were more qualified and reliable. Rather than sifting through dozens of contacts, they know that leads indicate an interest in SAS and its solutions. That was once a luxury for a salesperson. Now, it’s an everyday reality. To fine tune the model, analysts track the total number of leads passed to sales and the number of leads that convert to opportunities. The marketing team wants to make sure rates continue to rise for both numbers. If there is a plateau or a decline, the analysts receive rapid feedback and can adjust programs as necessary. SAS marketing analysts can also fine tune the model as sales requirements change or the market evolves. The model is more flexible than the rules-based approach, allowing the team to rapidly adjust strategies. The team can adjust the lead conversion rate if there is a shift in internal focus or if a sales group an increase or decrease in capacity. We've created a practical ebook to modernizing a marketing organization with marketing analytics: Your guide to modernizing the marketing organization. SAS Customer Intelligence 360 enables the delivery of contextually relevant emails, ensuring their content is personalized and timely. 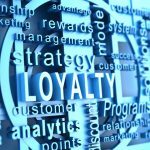 Emails sent with SAS Customer Intelligence 360 are backed by segmentation, analytics and scoring behind the scenes to help ensure messaging matches the customer journey. Editor’s note: This post is part of a series excerpted from Adele Sweetwood’s book, The Analytical Marketer: How to Transform Your Marketing Organization. Each post is a real-world case study of how to improve your customers’ experience and optimize your marketing campaigns. Scoring leads to drive more effective sales was published on Customer Intelligence. When in doubt, one of the easiest things marketers can do is send an email blast. The approach is predicated on a strength-in-numbers mentality. If you send out enough messages, somebody, somewhere, will receive it and take the desired action. While marketers still use blast messages, their value is waning. Why? You are competing for attention with your emails, website, advertisements, collateral, events and any other initiative. People are using their phones, computers, tablets and TVs to consume information. It’s harder than ever to reach, much less sway, a customer. By 2010, SAS marketing efforts included a blend of blasts and more personalized emails. The marketing team’s goal was to find the right mix of messages and communications methods that would anticipate customers’ needs and turn emails into a conversation with them on their journeys. The advent of a new customer-journey approach at SAS gave us an opportunity to rethink our email strategy and see what approaches worked best at different phases of the journey. The marketing team looked at historical data and asked some questions. For example, where along the path is thought leadership more effective than something product-specific? And where is third-party content more compelling than internal content? The marketing team members began assembling data on the customer journey and behavior across each phase. They found examples of customers receiving messages that were out of sync with their actual buying stage. For instance, a contact would receive messages designed for the early stages of a journey even after the deal was won (or lost). Scoring allowed the team to assign a value to all actions, not just registrations. Each interaction with SAS was tracked and added to the score. With more pervasive – and more realistic – scoring of these behaviors, the team could further analyze the relative value of different messages and offers. Segmentation identified the stage of the customer journey. Once scoring was complete and applied to contacts, the team could choose which message to send based on the stage. Automation provided the foundation for faster, analytics-driven communications. With segments in place, the team created targeted and relevant email communications to provide the right message at the right stage of the customer journey. Analytics delivered the right business strategy based on the desired outcome. Marketing analysts could evaluate how the entire marketing mix was working to move customers through different stages. Need. High-level messaging, including industry-specific content and thought leadership strategies. Blogs and articles at this phase explain the problem and provide a path forward. Research. Content that validates the customer’s need to solve the problem. Material here focuses on specific business issues and includes third-party resources like analyst reviews and research reports. Decide. 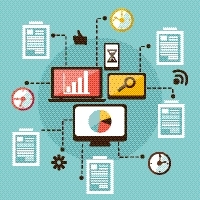 Deeper content that provides more product-specific information. This material validates the proposed solution through customer success stories, research reports, product fact sheets and so on. Adopt. On-board and self-service content. This stage focuses on introducing customers to support resources and online communities, as well as do-it-yourself material that introduces the customer to the solution. Use. Adoption content, such as advanced educational information, user conferences, and product-specific webinars. At this stage, users turn to more technical resources to expand their knowledge. Recommend. 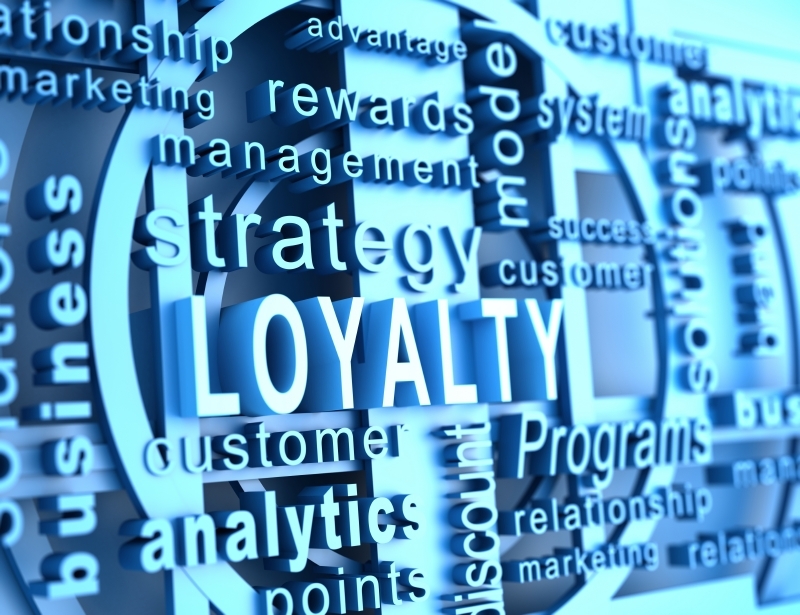 Content specific to extending the relationship with the customer. This includes speaking opportunities, focus group participation and sales references. When customers reach the buy phase, interactions occur primarily between sales and the customer. As a result, customers are typically excluded from email communications. Eventually, our entire online experience will be personalized as a way to best engage our customers and prospects and to help ensure we are communicating with them in a way that they prefer. How do we do this? By using customer experience analytics to track, analyze and then take action when appropriate based on behavior, instead of simply when we want to promote something. In other words, we have adopted an analytical mindset. Moving from blasts to conversations was published on Customer Intelligence. Machine learning has a high profile currently and is riding a wave of exposure in the media that includes articles about subjects from self-driving cars and self-landing rockets, to computers beating the world’s best players at Go, the most computationally complex board game in the world. Is there an opportunity for your organisation, and the marketers within it, to make use of this “new” technology? Machine learning techniques were developed as long ago as the 1950s, but with the advent of big data and large analytical engines, the prevalence and the ease of applying the techniques has increased. Additionally, organisations now understand the value that analytics can bring, so are willing to place it front and center in their plans and invest more time and resources in exploring new and better techniques. Segmentation and predictive models, for instance, have proven themselves time and again in the marketing world, but to a certain extent, they require a higher degree of knowledge to understand. 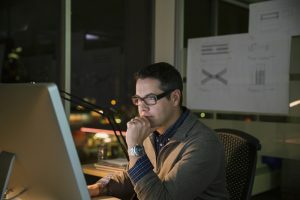 In some cases, a machine learning technique unburdens the user of the statistical work, but provides just as good an answer as a traditional technique. More people, with more data, trying to make more decisions lends itself to a technique that requires less manual intervention. Organizations, large and small, can have huge, complex data that can from the latest advances in machine learning – banks have transaction records, telcos have call details, retailers have purchase records. Take marketing in our omnichannel world as an example. There are huge amounts of customer interactions and there are business problems, such as attribution and optimizing the customer experience, that are perfect for the latest machine learning techniques. For real-time personalization of experience and real-time calculation of recommendations, great benefit can be gained from self-learning algorithms in reinforcement learning. But it is important to remember that organizations also have many analytically driven challenges that are smaller, simpler and just as important and valuable to the bottom line of the organization. Again, for marketing, more traditional disciplines like segmentation and propensity modeling are still extremely useful, and organizations need to keep using capabilities like these to ensure the continued benefits from their use. SAS has embraced machine learning techniques for many years, and recently took a further step forward with the latest release of our SAS Customer Intelligence 360 suite of products. SAS has built a recommendation engine with the best of both worlds – a predictive model built using traditional techniques (logistic regression) and a machine learning algorithm (using naïve Bayes classifiers). Fortunately, your customers don’t need to understand these techniques – they just want your website to make better recommendations! 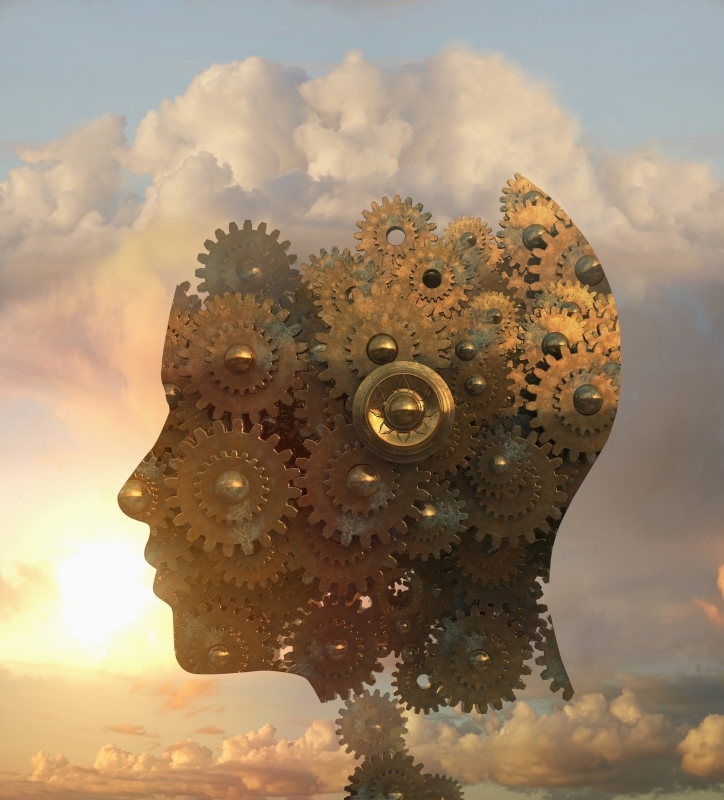 Machine learning and what it means for marketing was published on Customer Intelligence. 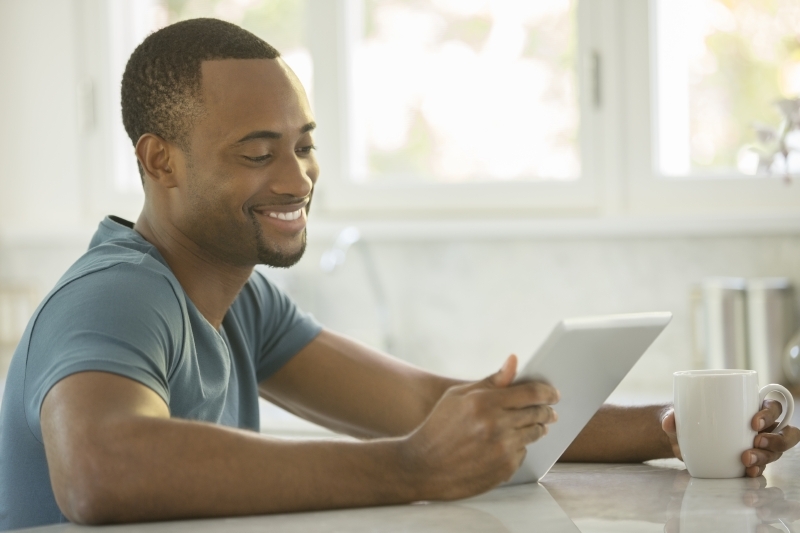 For the uninitiated, SAS 360 Engage enables organizations to interact with consumers by allowing them to create, manage and deliver digital content over web and mobile channels. Wait a minute. SAS does more than the analytics? That is correct. SAS 360 Engage is a marketing super force serving as a one-stop shop for data capture all the way through delivering highly-targeted, personalized digital experiences. Being able to dynamically place content and offers into digital channels – across devices and points in time – is nothing new for savvy marketing brands focused on optimization. As customer journeys spread across fragmented touch points while customers are demanding seamless and relevant experiences, content-oriented marketers have been forced to reevaluate their strategies for engagement. But the complexity, pace and volume of modern marketing easily overwhelms traditional planning and design approaches that rely on historical conventions, myopic single-channel perspectives and sequential act-and-learn iteration. Presently, marketers primarily use a variety of content optimization approaches that include A/B testing and multivariate testing. A/B testing, at its simplest, is a method of website or mobile optimization in which the conversion rates of two versions of a page are compared using visitor response rates. By tracking the way visitors interact with the content– the videos they watch, the buttons they click, or whether they sign up for a newsletter – you can infer which version of the content is most effective. Due to the popularity of this technique, SAS 360 Engage supports A/B/n testing. A/B/n testing is an extension of A/B testing, where “N” refers to the number of versions being tested, anywhere from two versions to the “nth” version. For example, when a brand has more than one idea for what the ideal digital experience should be, A/B/n can be used to compare each hypothesis and produce an optimized decision based on data, not subjectivity. Testing is attractive because it is efficient, measurable and serves as a machete cutting through the noise and assumptions associated with delivering effective experiences. In parallel, the evolving marketing landscape is driving a greater mandate for testing: to operate in more channels, handle more data and support more users. Testing must mature beyond traditional on-site experimentation to fully optimize a multifaceted customer journey. At the conclusion of an A/B/n test, there is usually a winner and one or more losers. Is there really one superior experience for your entire marketable audience? Is it possible that experiences should vary by segment? Performing algorithmic segmentation sounds awesome, but who really has the time to do it? We have so many tests to run. The time has arrived for predictive marketing to have its moment in the sun, and with Forrester recently naming SAS the leader in customer analytics, it's official - the 800-pound gorilla in advanced analytics is locked in on solving complex issues facing the space of data-driven marketing. Making digital personalization more relevant for target audiences is just like preparing a delicious meal; it all comes down to the ingredients and preparation process to rise to the occasion! A beautiful and interpretable visualization is generated highlighting what is unique about this segment, as compared to everyone else who was exposed to the test. If the brand wants to target this audience in future campaigns, a single click populates this segment in the platform for future journey orchestration. SAS 360 Engage was built with the recognition that some marketing teams don't have data scientists available, and have real needs for analytical automation. To improve upon the concept of A/B/n testing, augmenting this capability with automated, algorithmic segmentation with prescriptive results addresses an important need. Let's assume you've run an A/B/n test with four versions of a page, and variant A was crowned the champion. Wouldn't it be nice to know that if a specific segment arrived at your website, an alternative experience would facilitate a better result? SAS 360 Engage: A/B testing and algorithmic segmentation was published on Customer Intelligence. In my first post, I discussed the importance of brand equity and its relationship to good customer experience. 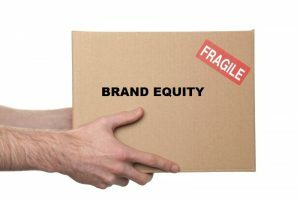 Consider this scenario of an organization where brand equity was negatively impacted by a fractured customer experience. In this case the “brand” is the corporate brand. It did not have a clear, complete picture of customers. Each business area had their own definition of the customer based on their own partial data. The marketing group targeted middle-aged, price-sensitive customers. Advertising bought media that was targeted to younger audiences. Customer service had no customer information. Stores, catalog and Internet channels had different marketing programs. Digital channels interacted with customers based on their narrow view of the customer. Data was not shared, so no one had a complete picture of customers. Marketing programs were not coordinated. Needless to say, this negatively impacted customer experience. Customers were showing up in the stores holding two or three different promotions valid for that week. Confusion reigned as neither customers or employees were sure which promotions were good in which channel, or which could be used in combination. The customer experience was a negative one, and marketing response rates declined as did sales and perception of the brand. It did not take long for Wall Street to figure out there were deep problems and the stock price sank. A unified view of the customer. The impetus was a turnaround CEO with a maniacal focus on customer and transparent coordination of processes around customer. His first order of business was to accelerate an already in-progress effort to consolidate customer data across the organization. He made data accessible to all business groups and channels for the tactical customer interaction decisions. For strategic decisions, he demanded an analysis to clearly identify and profile the best and next-best customers. He then required every decision be aligned with these customers. Every business area and every channel needed to show how their resources were being allocated to align with the various customer segments. Interactive channels needed to show how they were supporting consistent messaging to various customer segments and using data to personalize the experience. For the first time, there was transparency of advertising and marketing promotions across all channels. For the first time, business groups were aligned and had a coordinated message to communicate brand value to customers. Customers saw the same messaging across all channels. Customers understood what the brand stood for. Over the next few years, market share increased, stock price soared 800 percent. Employees were confident in their decisions and proud to work for the brand. This scenario is a great learning experience of what can go right with a brand by consolidating enterprise-wide customer data, and providing transparency across business groups and marketing programs. Management needs visibility into company-wide plans to make sure that budgets, creatives and programs all support the overall business strategy and the customer experience. SAS has strong marketing resource management capabilities that are completely integrated with marketing execution capabilities as well as performance metrics. For example, SAS Marketing Operations Management provides the ability to plan, manage and share programs across your SAS Customer Intelligence 360 platform gives you the ability to put those plans into action and engage with customers. Unfortunately, for the organization mentioned above, all the good was undone when a new CEO came in and decided that the current customers were not important for the direction he wanted to take the company. He changed pricing and promotions, corporate logo, store layouts and ditched strong product brands that current customers were loyal to. He severely eroded brand equity among current customers. He insisted that his changes would bring in younger, hipper customers. But it did not because the brand was not one those younger customers valued – no brand equity. That CEO did not last long but the damage was done. The company is now trying to recover from a massive debt burden and damage to its brand equity. In our scenario, the current CEO grounds every decision in data and information – not intuition and we will be able to tell a good story of recovery in the future. 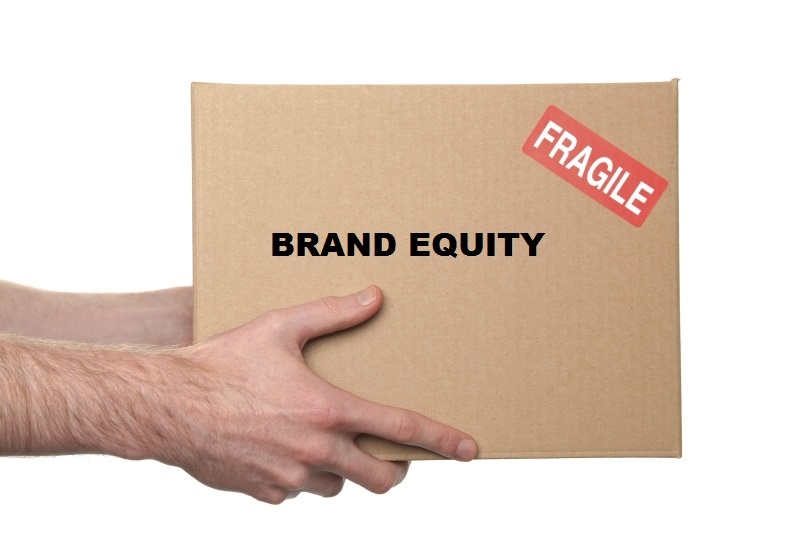 Data can help revive brand equity was published on Customer Intelligence.